New England Patriots quarterback Tom Brady is the subject of this stunning canvas artwork by the noted sports and pop artist Bernard Solco. Brady is shown in the abstract using primarily a black and white palate. His blue and red shoulder numbers provide a thrilling pop of color on this stoic 43 x 31-inch canvas. 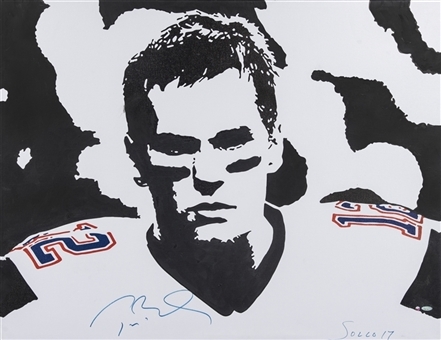 Brady has signed this canvas in crisp blue marker. Solco has signed this canvas as well and inscribed “17” after his signature. This item comes with a Steiner Sports hologram (SS226571) and a Tristar hologram (7757711).